We are a family owned business, currently introducing the 4th generation. Farber Specialty employs over 100 people and is engaged in the research, design, development and manufacture of custom specialty vehicles. A talented workforce with an extremely high retention rate has been the cornerstone of Farber Specialty Vehicles’ success. Our team leaders oversee a staff of more than 100 skilled craftsmen and have been in the industry from ten to thirty years. 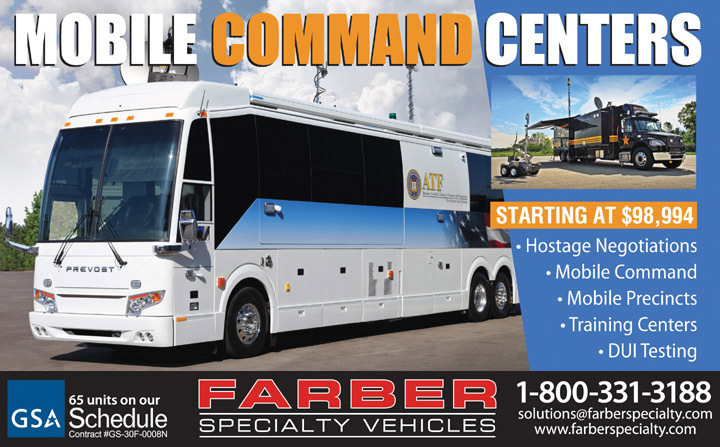 For more than 25 years, Farber Specialty Vehicles has custom-built mobile units to the exact specifications of our customers. FARBER vehicles are known for innovation using the latest and most advanced technologies. We manufacture a full line of vehicles in order to satisfy the diverse needs and budgets of the law enforcement field. Select from walk-in vans, motorhome style bodies, FARBER Coach or cutaway vans. Select a model that’s best for you based on body style, price and performance. Our 50,000 square foot manufacturing and assembly plant is located next to I-70 in Columbus, Ohio, ten minutes from the Columbus International Airport. Our electrical and mechanical engineering staff is dedicated to custom designing bodies and interior floor plans with AutoCAD and Solid Works computer design systems. In 2002, Farber purchased the assets of Custom Coach Corporation, the first company in the United States to offer custom conversions of commercial bus shells. Custom Coach a well-known manufacturer of executive and entertainer transportation was a complement to the already diverse Farber market.